ESCONDIDO — Residents inquired about pool and library hours, crime and a planned business park at Wednesday night’s town hall meeting. The somewhat casual Escondido forum was held in a question and answer format between locals and Mayor Sam Abed. Abed changed his position on city pool hours since the last town hall discussion held in October last year. He initially claimed that public pool and library hours fell outside of the city’s core functions and Escondido’s budget did not have the funds to pay for either type of facility to be open longer. But Wednesday, Abed repeatedly highlighted that the city had found the funds to open the two city pools every day of the week and increase the total hours of operation by 16 hours per week between both pools. “I would like to open the swimming pools for more hours. We would like to open the library on Sundays,” he said. Though no library hours on Sundays have been added at this time. City Manager Clay Phillips explained that the city is working to ensure that funds are not cut from library services in next year’s budget, which has not yet been approved. A slide shown by Abed showed that the library’s budget would be reduced by a couple thousand dollars next year. The city’s Director of Library and Community Services Loretta McKinney explained that the library’s budget would not be cut next year. Rather, a system change resulted in some library operations being paid for with capital improvement funds instead of library funds. Residents asked the mayor and city staff about what was being done to improve public safety in the city. Abed pointed out that much of the additional funds in last year’s budget were dedicated to hiring more police officers and raising the pay of police and fire employees. He also contested rumors that Escondido Police were deporting people for no reason through checkpoints, saturation patrols, and DUI checks. He stated that law enforcement only deported people with extensive criminal backgrounds. “We challenge anybody to prove to us that we are deporting people for anything other than criminal backgrounds. We owe it to you, we owe it to our Hispanic neighbors, we owe it to our Chinese neighbors,” Abed said. Escondido Police Chief Craig Carter said that through new community outreach programs, law enforcement is working on developing a relationship with citizens to increase crime reporting by citizens and improve code enforcement. He hopes that the efforts will not only reduce crime, but also graffiti and other code blemishes on city buildings and streets. He said that the latest crime statistics show a marked decrease in crime in Escondido already. The mayor renewed his promise of the development of the Cross Roads Business Park at the junction of Interstate 15 and state Route 78. He mentioned that the location is being considered by a large tech company even though the county is moving forward with establishing a central location for its expanding health and human services offices in a large portion of the proposed area for the park. He said that the business park would bring hundreds of jobs to the city and the nearby transit options would encourage people to utilize public transportation. He expressed that his dreams for his mayoral accomplishments would be complete if the business park came to fruition. “If I have the business park tomorrow, I will resign on Monday,” he said with a laugh. 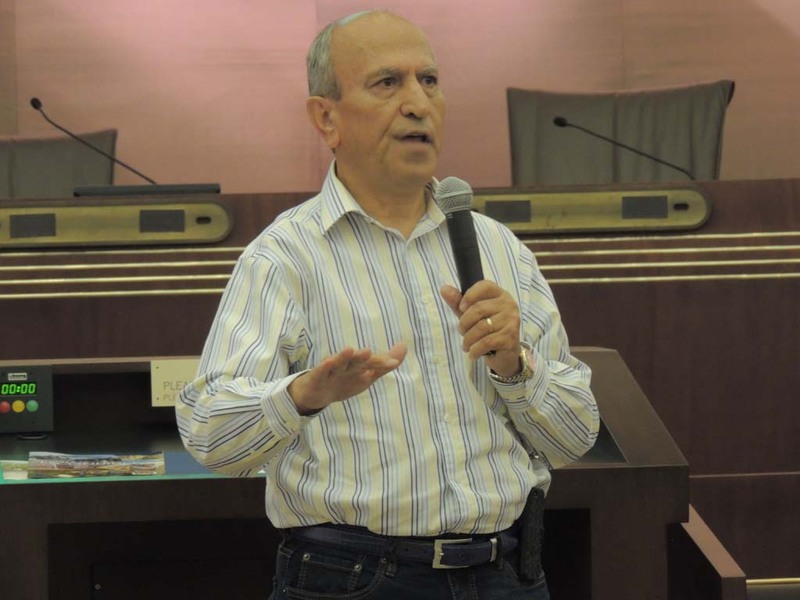 Abed also expressed his concerns about the city’s multi-million dollar unfunded pension liability, and said that the financial burden would influence his decisions on other spending matters.